3 Piece Suits|Three Piece Suits for Men on Sale! Here you will find deals on 3 piece suits that have all the style and attitude that you're looking for. 3 piece suits are more than just adding a matching vest to a jacket and pants. A 3 piece suit has a quality of style that just distinguishes the look from a 2 piece suit even if it's the same exact style and fabric. It's an image that you will portray. If you are looking for High Quality cheap Italian style 3 Piece Suit, ContempoSuits.com is the place for you. Shopping Online for deals on a discount vested 3 piece suit with an Italian cut or fashion style suit is the thing to do if you like wearing real skin shoes like Alligator Shoes with them. Wearing 3 piece men's suits is always a good choice because sometimes you just need to take off your suit jacket and with the vest you will still look well dressed. Statement regular fit suits are for the grown man who has style and isn't afraid to show it. The quality and fit of Statement suits is becoming known by men who like to get the best possible quality for a fine wool fashion suit that is designed in Italy and made of Italian wool fabric. If You like your suits with a modern fit that has more of a tailored demeanor and fit and appreciate fine Italian fabric, Statement is the brand of suits that brings all of that to the table for You. Statement suits knows how good fine Italian fabric is when it comes to Modern fit suits and that why You'll find them superior. 3 Piece suits are more than just adding a vest. A 3 piece suit is a fashion statement. 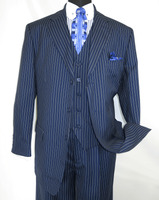 3 piece suits with banker stripes have a style statement that is all about class and sophistication. Exude quiet confidence when you put on this classy looking glen plaid 3 piece mens suit by Vinci. Glen Plaid Mens Suits are for the conservative dressing man who prefers not to draw undue attention to himself. There just is something very regal looking about wearing a 3 Piece suit that makes you stand out from the rest. Our Cheap Suits are very well made and don't look cheap at all. It takes a certain man or confidence to comfortably wear a men's suit of this type. You need to be a man who exudes prestige and doesn't bow to every style trend that comes and goes. Our 3 piece suits that are designed in Italy are a great way to look your very best. 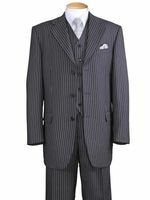 If you're looking for a great deal on a discount 3 piece suit, ContempoSuits.com is the place for you. Chances are you're going to need some new Italian style dress shoes as well. Checkout the fashionable and always affordable Stacy Adams Shoes. Read More About 3 Piece Suits Here. Shop Here for David Eden Shoes. When only the real deal will do, our selection of Crocodile Shoes are top notch. It's always been a general convention that a 3 piece style suit provides the wearer with choices on whether to wear the vest or not wear the vest. Chances are, you made that choice already to shop online for an Italian cut three piece suit. Why would you not want to wear the vest because the vest. It just adds that certain timeless classy appeal that always seems to be missing from just wearing a 2 piece suit. In fact if you look at old pictures and portraits of Gentlemen when they are dressed you almost always see them either wearing some sort of 3 piece suit. Maybe even wearing a suit with a stylish vest in some fashion. It was almost considered not being fully dressed back then if you weren't wearing a vest. Compliment that 3 piece suit you're shopping online for with a new Wool Overcoat Here. Need a suit made for the Summer heat, click here for our Linen Suits. Usually on introduction to the world of mens suits, the first type of suit you will probably wear is a two piece suit. Just your basic suit jacket and matching pants. Once you become accustomed to wearing mens suits, you may want to experimenting with your personal style and delve into a veteran suit wearers best friend, the 3 Piece Suit. The man who is secure with his sense of style are the types of people you will see wearing 3 piece vested Suits. The great thing about our inexpensive three piece suits is the simple fact that when you take the jacket off, you'll still look highly presentable and stylish because you're wearing your vest. It's just a dressier and more formal looking suit. The great thing about Our Inexpensive 3 piece suits is that they come in as many colors,patterns and varieties as two piece suits come. 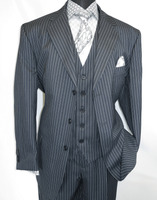 If you're shopping online for inexpensive pinstripe three piece suits, we have them. If you're shopping online for inexpensive solid black three piece suits, we have them.If you're shopping online for inexpensive white three piece suits, we have them. 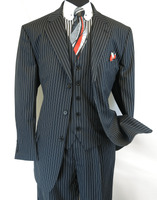 If you're shopping online for inexpensive shadow stripe three piece suits, we have them. Established bankers have long known the value of wearing 3 piece vested suits because it gives them an aura of respect and power that simply can't be denied. In the old days you would see men wearing their vested suits with their pocket watch chain visible outside of the vest itself. Oftentimes they come with pocket watch pockets as an homage of days gone by. When you see a man wearing a three piece vested suit you will immediately think that this man has decision making capabilities involved with his career. I highly recommend checking them out. Shopping online for discount 3 piece suits will be a very easy experience because of our huge selection and fast shipping. You pick out the discount price 3 piece suit you like, you place your order and a few days later, the UPS man shows up at your door. Shopping online for discount 3 Piece suits on sale is a no brainer because ContempoSuits.com is the online store that sells inexpensive 3 piece suits with free shipping over $99. A 3 Piece Suit is so much more than an added vest. The 3 piece suit is primarily the suit jacket, the slacks and the addition of the vest or waistcoat. It is the addition of the vest that makes a suit a 3 piece style suit. Now we could just leave it here and not discuss further what these suits are but they are more than just a 2 piece suit with the addition of the vest. You see, when you add the vest to the suit, it transforms the suit into something in which it wasn't before. The vest gives the suit a whole new personality that just wasn't there previously when it was missing the vest. When you have the vest on, you all of a sudden can wear the suit in such a way that just would look right if you were not wearing it. For instance, when you are walking around, you don't have to necessarily button your suit jacket for a proper look because the vest underneath will still let your ensemble look well put together. You will notice that you are indeed wearing your suit differently as well by the way you may hold your jacket open with your hand in a sophisticated and stylish manner. You could never do this with a two piece suit because it just wouldn't look right. There is something about the addition of that vest to your suit that just lets you do that and look simply fantastic doing it. You will notice that these days choice is always a huge consideration and choices you will have indeed. There are all types of 3 piece suits from your basic business style 3 piece to your more fashion inspired three piece that have fancy style vests such as double breasted style or even fancy paisley pattern vests simply for the purpose of style and fashion. Depending on where you intend to wear your suit, the choice is up to you for that look that will set you apart and let people there know that you have a hand on style and know how to handle it. The more stylish the vest on your suit is more likely that you will want to showcase it and it will affect how you carry yourself while wearing your 3 piece suit. Let's say that your suit has a stylish double breasted vest with lapels on it like were worn back in the 1920s, you know that the way you wear the jacket and carry yourself will surely be different than if you were wearing a simple 2 piece suit. You're going to want to have people see your vest and you're going to hold your jacket just slightly open to allow the style of your suit to come alive. That is what you can guarantee when it comes to these types of mens suits. Some 3 Piece Suits have fancy style vests. 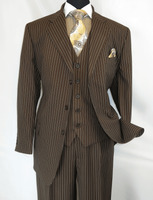 There has been a huge resurgence these days with replicating the stylish nature of 3 piece suits from the 1920s. Back in the 1920s it was not uncommon for men to wear suits that didn't look like cookie cutter business suits of the our era but suits that had more stylish fabrics patterns and styles that wouldn't be worn in offices of today. When a man got dressed and went out on the streets of any city. He was showcasing the type of man he was and his means and his 3 piece suit was the message. It is why the 3 piece suits of that era had more style in general with fancy lapel vests or double breasted style vests worn underneath. It was all about style but not making a spectacle of your self either. Now in our era there is a huge choice of patterned 3 piece suits and even colors that are stylish but not office friendly. You will find all types of plaid fabrics as well as stripes that really showcase the style of your 3 piece suit and all of these fancy patterns are derived from the 1920s era. Take a look at any prohibition era movie and you will notice the similarity of style that the 3 piece suits had back then to the 3 piece suits that are available these days. The vests on the fashion style 3 piece suit is always the focal point. It has become a stand alone item that if the man takes his jacket off, his style is still in check and showcased properly. Some of the fancier styles have unique back straps on them as well as the fancy types of lapels that can be your standard notched, peaked or even shawl collar styles on the vest. All with an intention of style that is for setting you apart and letting people know that you love dressing with style. Most of the vests primarily will be made of the same fabric as the rest of the suit but there are some styles that will be made of a contrasting fabric that is either a different pattern fabric such as paisley with a solid color jacket and pants or solid color vest with patterned jacket and pants for a different look. This is pure style indeed and also derives from the 1920s and even earlier. Always leave the last button undone on your vest. Now wearing 3 piece suit is not something that should be done without any forethought. You have to take consideration of how a 3 piece suit is supposed to fit. First thing first. You need to make sure that your suit actually fits you properly where the body of the jacket fits right and collar of jacket hugs your neck just so without any gap around the neck. That is never a good look. The sleeves on your jacket break at the wrist for that perfect fit and the slacks on your suit are the perfect fit and length breaking just so over your shoes. Not too long and certainly not too short. Now lets take a look at the vest you're going to wear. The first thing is that length of the vest on a basic 3 piece suit should just cover your belt or the waistband of your pants. There are some who feel that a man who wears a 3 piece suit should never wear a belt because of the bulge of the belt buckle and should only wear suspenders or braces. I feel that if you want to wear a belt, wear a belt. Make sure though that on the vest, the last button is always undone. Never button it completely. This is for ease of movement and not letting the vest pull where your hips begin. It also looks better than wearing the vest fully buttoned. When you button the entire vest, it just doesn't look right. This goes for suit jackets as well. never ever button the entire suit jacket. Always leave the bottom button undone no matter what. Deciding when you wear your 3 piece suit is certainly nothing to take likely. Now if you have a basic office job where a suit is required, you better make sure that your 3 piece suit is business style conservative suit. Basic Grays and blues in a regular fit with a 2 button jacket and basic 5 or 6 button vest. No style is allowed here. Not ever. This is work and the suit is a uniform. Get it, "uniform". You are supposed to fit in and draw attention to yourself. You're at work buddy. Your work is suppose to be in the spotlight, not what you're wearing. Now when you're wearing a 3 piece suit to work, you naturally keep that jacket of yours properly buttoned for that business like banker look. No style permitted. If you're on your own clock and not at work, you can naturally wear your suit however you like with flair or not. If you're going to a party or wedding, that is when you can wear your more stylish 3 piece suits that come with the double breasted style vests or are made of fine patterned fabrics that are more style oriented than the type of suit you would wear to the office. This is when you can showcase your style the way want and show people you know how to wear a suit. 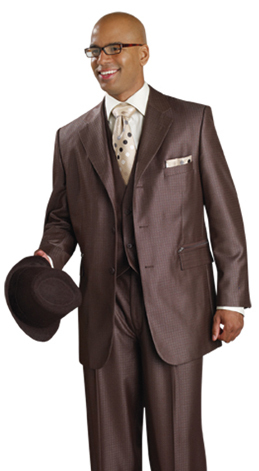 The 3 piece suit is perfect for wearing to Church on Sunday. Church has always been a great place to wear a 3 piece suit because hey, you're in the house of God and not at work. You can wear those suits you have with style and make conversation about them after the service while talking to your fellow Church goers. This is a great place for discussing your taste in suits and shoes and you can wear those fancier 3 piece suits of yours and look your absolute very best. Most of our customers buy our suits and where them primarily to Church, so you'll fit right in wearing stylish 3 piece suits that are all hooked up with the latest dress shoes to match. Many of our customers take their style seriously and get decked out matching from head to toe with the matching dress hat right down to the fancy dress shirt and tie set to the matching dress shoes for a complete look that is conversation piece all on it's own.